Sometimes, it is difficult trying to be the real thing. There are certain times when the highest level of authenticity is a little too high. Like if you really wanted to convince people that you were the Predator, you’d want to use a cloaking device to make yourself almost totally invisible. Are you recognizing the issue with that tactic? Sure, you’re convincing… but… convincing as what exactly? A hazy cloud of air? Yeah… invisible you may be, but how will people appreciate the super-awesome costume you were wearing underneath? So, as with most things in the cosmos, you must strike a compromise. Fear not, though. We wouldn’t leave you to these galactic challenges without support. 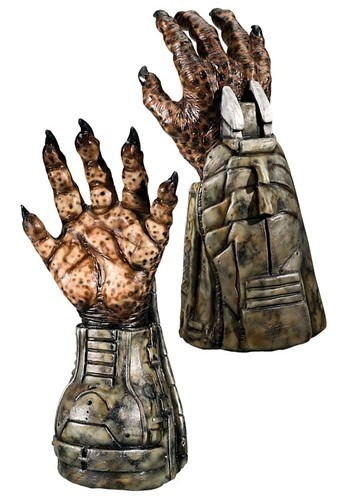 Now you can give your Predator costume the final touch with these Deluxe Predator Hands. Sure, the real horror of a thriller film is not being able to see the monster, but the second most spooky moment is when you do not even realize that the monster is standing next to you. Give your buddies a high five… and then take their hand with you when you freak them all out by completing your Predator costume with the claws of a real, deadly hunter.